It was reported that same day that the Economic Community of West African States (ECOWAS) was dispatching troops to assist Mali as well: Nigeria is sending 600 soldiers, Senegal, Burkina Faso, and Togo 500 each, and Benin 300. The United Kingdom is providing two C-17 transport planes, and the United States has promised logistic support. In unscheduled debate on the Mali situation during a plenary session of the European Parliament in Strasbourg, MEPs were almost unanimous in their support for France. Encouraged by this development, France’s Permanent Representative to the UN, Gerard Aro, said after the Security Council session that his country is counting on the speedy deployment of African Union troops to Mali. He said Operation Serval is not a substitute for the deployment of African forces to Mali, and Paris is not planning to be the only guarantor of security in the region. However, representatives of the Tuaregs’ main political force stressed that they do not want Mali government troops to return to Azawad, which they consider independent of the central government in Bamako. The Tuaregs’ interest in the situation is clear. They, like the Iraqi Kurds in 2003 or the Syrian Kurds during the ongoing Syrian crisis, are trying to take maximum advantage of the situation, justifiably believing that they own a “golden share” in the escalating conflict. Of course, the Movement’s leaders are counting on French support to legitimize last year’s proclamation of independence while simultaneously evening the score with their chief oppressors. Let’s try and understand why Paris is so concerned about the situation Mali’s hapless leaders find themselves in. In a previous article for New Eastern Outlook, I wrote that France has been saying ever since Nicolas Sarkozy’s presidency that it is determined to put relations with countries of the European Union’s Southern Partners” on a new footing by using the personal touch and its favorite but as yet non-functional foreign policy “toy” — the Mediterranean Union. On that score, I would note that the Sarkozy government is focused both on the former French colonies and countries in non-francophone northern Africa, especially Southern Sudan and Libya. The one has potential hydrocarbon reserves, and the other is actually producing oil. The Africa-France summit in Nice was revealing. 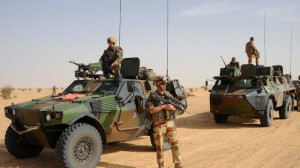 In addition, the French Army had contributed to regime change in Côte d’Ivoire, Chad and the Central African Republic prior to its involvement in the Libyan campaign of 2011. The new resident of the Palais de l’Elysee, Francois Hollande, has apparently decided to follow in his predecessor’s footsteps. It is now a point of honor for the new administration to outdo Sarkozy’s team by leaning on Syria and avoiding a repetition in Mali of the mistakes made in Libya — especially since there are sound economic reasons beyond personal ambition for doing so. Everything was proceeding more or less smoothly at first. Since early last year, however, the French have increasingly been encountering problems — especially in Libya, where Qatar is backing the tribal leaders in oil-rich Cyrenaica. By the middle of last year Qatar was no longer suppressing its irritation at France’s activities in Africa. The confrontation between Paris and Doha recently has been almost overt. The killing of two private security firm heads in Libya, the so-called “French debt” issue which was first mentioned last year by the most outspoken of Gadhafi’s sons — Seif al-Islam — and the increasingly acrimonious comments addressed aimed at France’s leaders by Qatar-based Al Jazeera all provide clear confirmation of that. And behind the Islamist groups challenging Paris and Mali we can see the shadows of several Persian Gulf Arab monarchies that have become restless in recent years. Three Islamist groups currently are the chief troublemakers in the Mali crisis: al-Qaeda in the Islamic Maghreb, the Salafist Movement for Unity and Jihad in West Africa, and Ansar al-Din (“Defenders of the Faith”). Ansar al-Din may be the leader of this troika. Little is known about that organization. However, analysis of the group’s leadership yields a very interesting picture. “Sheikh” Iyad Ag Ghali, its founder and current ideological leader and military commander, became imbued with the ideas of Salafism and radical Islam while serving as Mali’s envoy to Saudi Arabia (which actually resulted in his recall home). The organization’s number two man, Alghabass Ag Intallah, one of the most famous men in Northern Mali, has links to Doha. He is on good terms with Qatari emirs, and he is believed to control injections of cash to Ansar al-Din from Qatar. Overall, it is quite obvious that the military operations in Mali are an outgrowth of the conflict between France and Qatar. It has frequently happened in the history of the world that former allies begin dividing up the spoils after achieving the desired result. If the chief actors in the fight with “authoritarian regimes” in the Greater Middle East fail to agree soon on spheres of influence in North Africa, the situation in Western Sudan will deteriorate and the conflict will spread to Europe itself.